﻿﻿Once you have exported your details from Linkedin, you can then edit them and then choose the theme to suit you. You can choose the infographic theme from six current options and then choose a colour scheme to go with it. There are currently options to allow you to embed a link in a website, and share your infographic on social networking sites. There will be an option to export the graphic CV to PDF and print it, but this is not available at the moment. Vizualize.me is not the only one fostering the visual curriculum vitae idea. I have just recently come across a second infographic tool, re.vu which seems to do a similar thing. 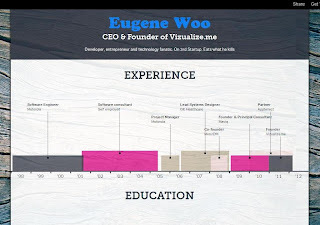 A visual representation of your career and educational history has obvious appeal to those in the graphic and design field but I do think library and information professionals could benefit from using this as an add-on to their professional online presence. It’s an interesting way to be able to show where your experience comes in a chronological order but without it being a typically boring resume. this looks like a terrific tool, can't wait to try it, thanks!